There’s a bland little storefront at 3107 Pico in Santa Monica that was recently acquired by Nike. Bedecked with red awnings and minimal signage, it’s unremarkable but for the vintage VW bus parked out front, the side of which is emblazoned with the letters “BRS.” The acronym stands for Blue Ribbon Sports, which, you probably don’t know or recall, was the name of the company that would become Nike. The Pico spot was BRS’s first brick-and-mortar and functioned as both a shoe shop and a sanctuary for runners (a marginalized class circa the store’s 1966 opening—more on that in a sec). On January 25, Nike reopened its first home to the public as part of a plan to rekindle the forged-in-the-crucible-of-car-culture gumption of the earliest recreational joggers. For context, remember that until fairly recently, you couldn’t go for a run without some jerk in a Cadillac lobbing a beer can at your head. “If you happen to see some gent you consider old enough to know better jogging down a street, curb your instinct to call the police,” the writer of a 1966 article in the Los Angeles Times half joked. But that wasn’t hyperbole. Two years later, The New York Times ran accounts of innocent suburban joggers getting harangued by police—pursued through their neighborhoods even—in Connecticut and South Carolina. Motorists practically ran runners off the road. “People would throw things, sideswipe you, squirt you with various spooky things that come out of squirt containers,” says Nelson Farris, Nike’s senior director of culture and heritage, and the company’s longest-tenured employee. Despite the hurdles, joggers kept jogging for the sheer joy of it. “It was nirvana,” Farris reminisces. And the enthusiasm of Farris and his ostensibly crazy compatriots was matched by an equally crazy shoe company. Cofounded in 1964 by Oregon native Phil Knight and University of Oregon track coach Bill Bowerman, Blue Ribbon Sports began with Knight importing Japan’s Onitsuka Tiger shoes (you know them as Asics) and distributing them from the trunk of his car at track meets. That primitive operation soon morphed into a mail-order business. From there, a friend of Knight’s—Jeff Johnson, the company’s first employee—was tasked with opening an inaugural retail space. 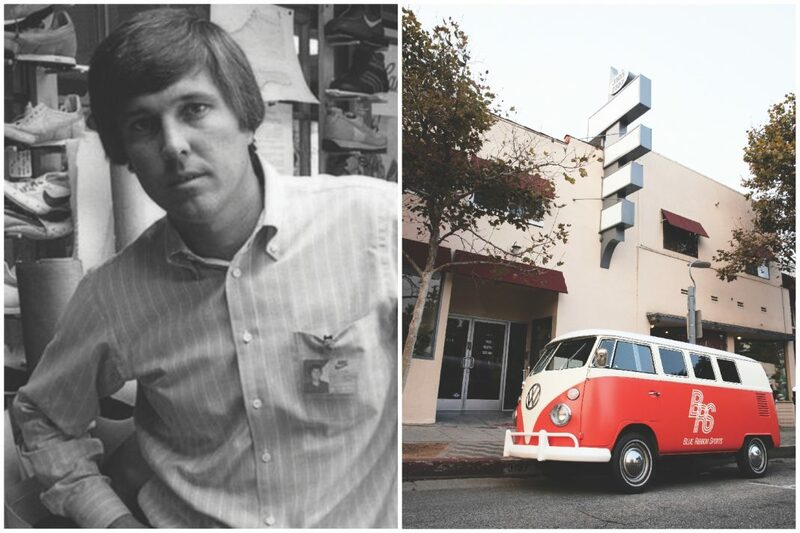 When he found what he describes as a “small, nondescript but affordable storefront” on the “sun beaten outskirts of west Los Angeles” (per a 2018 letter to the Department of Nike Archives), Johnson knew he’d found a place that the outliers could call home. Shortly thereafter, a community sprang up around that unassuming shoe store. In his 2016 book Shoe Dog, Knight writes that “Johnson, the aspiring cult leader of runners, finally had his church.” Indefatigable, the guy fleshed out the shop with running books and magazines from his personal library, and plastered the walls with photographs he took of local athletes wearing Tiger shoes in competition. He always had entry blanks for upcoming races on hand. “Belying its modest exterior,” Johnson, now 75, writes, “3107 became a haven for runners, those then few oddball athletes occasionally seen running through the streets, seemingly in their underwear…pursuing their dreams in their as-yet-unappreciated sport.” And those die-hard runners who flocked to BRS proved to be quite the burgeoning market. Knight and Bowerman changed the brand’s name to Nike in 1971—borrowing the Greek goddess of victory’s moniker was Johnson’s idea—and released the first shoe of their design under the Nike name that year. Bolstered by the viral trendification of jogging (thanks in large part to a book Bowerman published on the subject in ’67), Nike grew like gangbusters and planted retail outposts across the nation. Today it’s considered the most valuable fashion brand in the world, worth upward of $28 billion. Sure, there’s some subtle brand reinforcement going on, but take it at face value, and what you have is a celebration of running for the borderline-revolutionary reclamation of public space that it is.